To combat salinity, plants need easily accessible, safe and sustainable mechanisms for optimum growth. Recently, endophytes proved to be the promising candidates that helped the host plant to thrive under stress conditions. Therefore, the aim was to discover endophytic strain(s) and their mechanism of action to alleviate salt stress in maize. Keeping the diverse role of endophytes in view, 9 endophytic fungi from the spines of Euphorbia milli L. were isolated. Among the isolated fungal isolates, isolate FH1 was selected for further study on the basis of high antioxidant activity and capability to produce high indole-3-acetic acid (IAA), indole-3-acetamide (IAM), phenol and flavonoid contents. The 18S rDNA sequence homology and phylogenetic analysis of the fungal isolate FH1 revealed to be Yarrowia lipolytica. Furthermore, the inoculation of Y. lipolytica FH1 had significantly promoted plant growth attributes in treated maize as compared to positive (salt stress) and negative (salt stress free) controls. Likewise, differences in chlorophyll, carotenes, electrolyte leakage, leaf relative water, peroxidase, catalase, ABA, IAA and proline contents were observed between treated maize and controls. Interestingly, Y. lipolytica FH1 inoculated plants showed lower endogenous ABA and higher endogenous IAA contents. From the results, we have concluded that Y. lipolytica inoculation has promoted the growth of maize plants through controlled metabolism and hormonal secretions (ABA and IAA) under salinity stress. Because of the fact, Y. lipolytica can be tried as an eco-friendly bio-fertilizer to achieve optimum crop productivity under saline conditions. Maize (Zea mays L.) is an important cereal that contributes towards human food and animal feed worldwide . The major maize producing countries include USA, Mexico, Nigeria, France, and Hungary. In Pakistan, maize is grown for the fresh market in various parts of Khyber Pakhtunkhwa. But the productivity of this valuable crop has been decreased over the years due to continuous change in the environment. Amongst various factors, salinity is one of the reasons that drastically affected the maize growth and productivity . Salinity is in fact a global issue because more than 70 countries of the worlds have been marked by this problem. Also, rapid increases in the area of salt-affected land (45 million hectares in 1992 to 62 million ha in 2013) indicate the devastating nature of the problem. Based on this data, it is extrapolated that an area of 2000 ha catches salinity every day . According to the statistical calculations, almost 6.5 million hectares of irrigated land in Pakistan is severely affected by various levels of salinity . Interestingly, the most common source of salinity is irrigation water itself. Significant quantities of salts are contributed by using fresh water in irrigation, which was believed to have a negligible amount of salts. In dry hot areas, accumulation of salts is faster because of the rapid evaporation of irrigated water . Climate change and high evaporation rate enhances salt accumulation in soil, which reduces soil water potential and water uptake by plant roots . Prolonged exposures of plants to salinity results in excess accumulation of Na+ into plants, thus disturbing K+/Na+ balance and ultimately plant metabolism. Besides, plants exposed to salt stress can produce/accumulate excessive amounts of reactive oxygen species (ROS), disturbing electron transport chain in chloroplast and mitochondria . Other consequences of hyper-accumulation of ROS, include membrane damage, cellular proteins, chlorophyll and nucleic acids damages . To control production losses related to salinity in economically important crops, concrete biological measures are needed to optimize crop yield. Endophytic fungi residing in plant tissues can serve the purpose at the best . Currently, utilization of endophytic fungi to mitigate severe salt stress in an environmental friendly way is an emerging technique to fix the problem. Endophytes can regulate plant physiological activities against abiotic stresses by releasing and/or enhancing the capability of the host plant to produce phytohormones (gibberellins, auxin, cytokinin, abscisic acid) and secondary metabolites (phenols and flavonoids) . IAA is known to control root growth under salinity stress, inhibit H2O2 production, antagonize ethylene-based abscission and promote overall plant growth . Flavonoids, on the other hand, can trigger IAA accumulation in the root nodules of host plants and motivate colonization of endophytes under stress conditions . Similarly, ABA can control stomatal functioning to minimize water losses. Also, it can regulate stress-responsive genes to mediate plant defense system against stress damages . Though there are studies related to the plant-microbe interaction, yet the field is still open to discover endophytes and their interactions with host plants under stress. In this study, we have focused on the role of endophytic Y. lipolytica FH1 in alleviating salt stress in maize seedlings. From the surface sterilized spines of Euphorbia milli about 9 endophytic fungal strains were isolated. Furthermore, only the FH1 isolate have shown resistance to 100 mM NaCl salt stress and selected for further study. A 90% of fungal colonization frequency was observed on spine segments placed in Hagem media plates with FH1 (38%) was the most dominant colonizer (Table 1). Similarly, the isolate FH1 produced IAA, polyphenols and flavonoids in appreciable quantities and exhibited DPPH activity (Table 1). The isolate FH1 was identified by comparing its internal transcribed spacer (ITS) region including a partial sequence of 18S rDNA, the complete sequence of ITS1 and ITS2, the complete sequence of 5.8S rDNA and partial sequence of 28S rDNA genes sequence with the related sequences available in the GenBank database of NCBI (https://blast.ncbi.nlm.nih.gov/Blast.cgi). The isolate FH1 sequence showed 99% homology, 99% query coverage and 0.0 E values with 99% identity to Yarrowia lipolytica. The closely related sequences were retrieved from GenBank and subjected to phylogenetic analysis by using MEGA 7 to construct maximum likelihood tree. 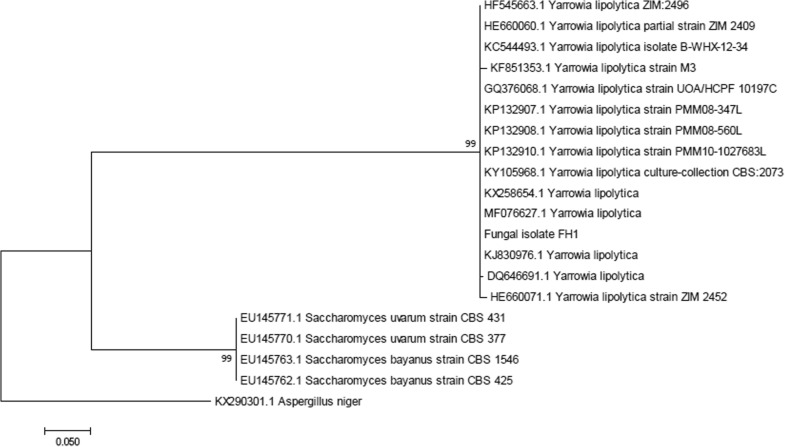 The isolate was grouped with Yarrowia lipolytica having 99 bootstrap supports (Fig. 1). The gene sequence of the isolate FH1 was submitted to NCBI GenBank and was allotted with accession no. KY673731. The fungal isolate FH1 greatly promoted the growth attributes of maize plants under salt stress, as the Y. lipolytica FH1 inoculated plants showed higher plant growth and pigmentation under stress conditions (Fig. 2). The fungal associated maize seedlings under salinity possessed significantly (P < 0.05) higher chlorophyll a (Fig. 2a), chlorophyll b (Fig. 2b) and carotenoid (Fig. 2c) contents compared to their respective controls. From the results it is quite evident that the selected salts have significantly (P < 0.05) reduced plant weight as compared to the control (Fig. 3a). On the other hand, the salt stressed maize plants inoculated with Y. lipolytica FH1had lost less weight as compared to the control. 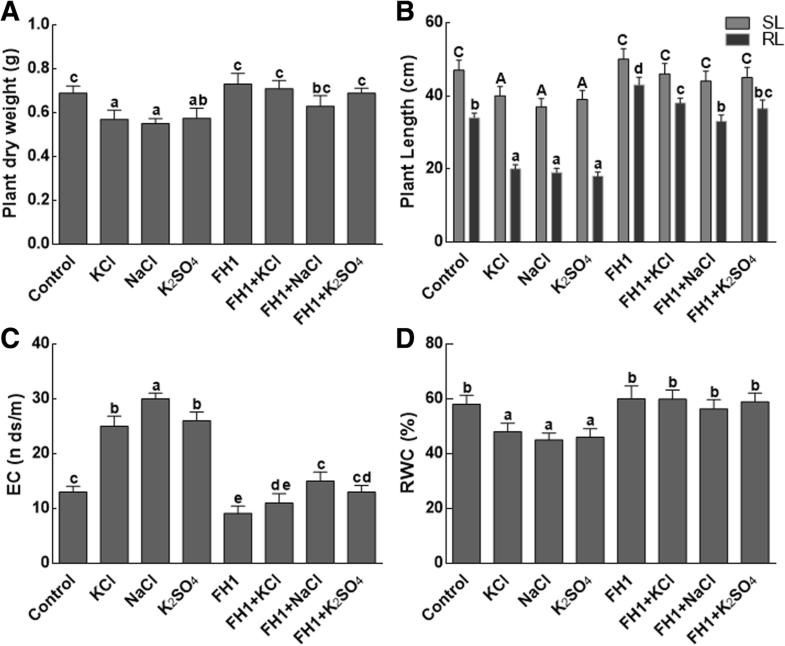 A significantly (P < 0.05) higher weight have attained by the non-stressed, FH1 inoculated maize plants (Fig. 3a). Similarly, maize seedlings in association with FH1 have significantly longer roots and shoots as compared to the non-associated maize plants with or without salt stress (Fig. 3b). Moreover, the electrolyte leakage was found significantly (P < 0.05) higher in salt stress treatments as compared to control (Fig. 3c). The NaCl (100 mM) triggered electrolytes leakage by 2.5 times higher, while the effect of KCl and K2SO4 (100 mM each) was 2 times as compared to the control. However, the fungal association has reduced the electrolyte leakage in maize seedlings under saline conditions (Fig. 3c). Likewise, a significant decrease in relative water content (RWC) of maize seedlings was observed in salt-stressed treatments (Fig. 3d). The RWC was higher in maize plants associated with Y. lipolytica FH1. A non-significant (P < 0.05) change has been observed in RWC of maize plants inoculated with FH1 as compared to the control plants (Fig. 3c). The concentration of endogenous IAA was determined in endophytes associated and non-associated maize seedlings cultivated under control (no salt) and saline conditions. The results exhibited that the IAA contents of maize plants have increased by almost 100%, when the plants have inoculated with FH1as compared to the non-inoculated plants (Fig. 4a). A 3 fold increase in percent IAA contents has been recorded in FH1 inoculated stressed plants as compared to the salt stressed controls. On the contrary, significantly (P < 0.05) higher amounts of abscisic acid (ABA) have been noticed in non-inoculated maize plants under salt stress as compared to the inoculated plants (Fig. 4b). Also, non-significant differences concerning the ABA contents have been noticed in the non-inoculated control treatments as compared to the inoculated plants under salinity. In short, the FH1 inoculated plants have significantly lower concentrations of ABA as compared to their respective controls (Fig. 4b). Salt stress triggered much higher accumulation of proline, peroxidase (POD) and catalase as compared to the non-stressed plants (Fig. 5). However, the fungal inoculation of maize plants under salt stress has significantly (P < 0.05) controlled the production of proline, peroxidase (POD) and catalase. Approximately, 3-fold decrease in proline contents (Fig. 5a), 1.5-fold decrease in POD activity (Fig. 5b) and 5-fold decrease in CAT activity (Fig. 5c) have been noted in fungal inoculated maize plant as compared to non-inoculated plants. Endophytic fungi depend on host plants for nourishment, water and physical protection against biotic and abiotic adversities. In return, the endophyte secretes secondary metabolites, e.g. phenols and flavonoids . A wide array of biologically active secondary metabolites has been isolated from endophytic fungi [13, 14]. Nonetheless, very little knowledge is available regarding the synthesis and secretion of plant growth regulators, phenols, flavonoids, DPPH activity of the endophytic fungi culture filtrate under salt stress. In this study, we isolated 9 endophytic fungi from the spines of E. milli, a well-known xerophyte. Y. lipolytica FH1 was selected for current study based on its resistance to 100 mM salt stress and IAA biosynthesis capabilities. The CF of Y. lipolytica FH1 was screened for secondary metabolites. Y. lipolytica FH1 produced IAA and promoted growth of maize seedlings. Therefore, restoration of growth in treated maize seedlings might be attributed to the IAA secreted by FH1. The ability of endophytes to produce IAA can be linked with two important putative genes (IaaM and IaaH). The putative IaaM and IaaH genes code for enzymes tryptophan-2-monooxygenase and indole-3-acetamide hydrolase suggested that IAA biosynthesis was a two-step process that progresses via an indole-3-acetamide pathway . Waqas et al. (2012) reported the detection of IAA in the culture filtrates of endophytic isolates of P. glomerata and the positive role of IAA in plant growth promotion under saline conditions. Our current findings regarding IAA production and mitigation of salt stress by Y. lipolytica FH1 are in close agreement with that of N Saeed, MR Khan and M Shabbir . On the other hand, various reasons are responsible for the decrease in crop growth under salinity. One of the important reasons may be the limitation of photosynthesis in plants exposed to saline conditions. Under salinity stress chloroplast accumulates excessive Na+, which inhibits PS-II activity and thus deters photosynthesis and ultimately growth rate . Also high salinity induces ethylene production in plants, which inhibit chlorophyll biosynthetic pathway . High amount of Na+ in the maize cell might hinder the growth and development of maize through negative osmotic potential, thereby reducing the uptake of water and minerals like K+ under salinity stress. The response of maize seedlings to selected salts (KCl, NaCl and K2SO4) in the current study was different. Among the selected salts, NaCl was the most toxic that limited the growth of maize by interfering with the physiological processes of the maize. The adverse effects of NaCl were evident from low chlorophyll contents, reduced shoot and root growth, lighter plant (fresh and dry weight basis), low relative water contents and higher electrolytes leakage. The decrease in plant relative water content reflects on physiological drought forcibly imposed on plants, as soil solution in saline areas is hypertonic in relation to cell sap . Another phenomenon that was affected by salt stress was changes in endogenous phytohormones, i.e. high ABA and low IAA content. ABA is reported to perform key role in the regulation of signaling pathways, which are involved in plant growth and development under salt stress . It has previously been demonstrated that fungal inoculation has a role in increasing ABA contents of host plant under salt stress . Similarly, IAA is essential for plants growth and development due to its function in root, axillary bud and flower development. Certainly, IAA (either exogenous or endogenous) can regulate various developmental processes in plants under abiotic stress [20, 21]. In this study, high contents of IAA were noticed in plants that were inoculated with Y. lipolytica FH1 and exposed to salt stress. Our results suggested that ABA and IAA have contrasting roles in plant response to salt stress. Additionally, the inoculated Y. lipolytica FH1 helped the maize seedlings to stand against salt stress that was quite evident from the accumulation of pigments (chlorophyll and carotenoids content), a decrease in electrolyte leakage, increased seedlings growth and improvement in leaf relative water content. Indeed, maize seedlings tried to withstand the adverse effects of salts by increasing production of the POD, catalase, and proline. The results suggested that under stress conditions, endophytic fungi modulated the host plant system in order to detoxify the hazardous ROS rather enabling the host plant to avoid uptake of salts. Scavenging of the salt-induced H2O2 by catalase and peroxidase may be an effective mechanism of plants to overcome salinity stress . Significant aggregation of proline in Paecilomyces formosus associated plants growing under salinity stress, suggesting a decline in ionic influx inside the cellular masses and rescuing plants to maintain its osmotic balance . Besides, the up-regulation of genes associated with CAT, POD and proline in maize plants, the endophyte might also contribute towards the resistance against salinity stress  which supports our results. From the current findings, we have concluded that the endophytic association of Y. lipolytica FH1 with maize plants has significantly improved the growth of maize under salt stress. The recovery of fungal inoculated maize plants (in terms of growth and development) under stress conditions can be linked with the secreation of exogenous IAA and regulation of maize endogenous IAA and ABA. In fact, the normal secretion of endogenous IAA and ABA by maize plants under salinity can be attributed to the association of Y. lipolytica FH1. Also, FH1association has controlled the production of POD, CAT and proline in maize plants under salt stress. In the present study, 9 endophytic fungal isolates were isolated from the spines of Euphorbia milli, an ornamental plant easily available at Abdul Wali Khan University, district Mardan. The district lies from 34° 05′ to 34° 32′ north latitudes and 71″ 48′ to 72° 25′ east longitudes. The average temperature of Mardan is 23.2 °C with an average rain fall of 110 mm. The characteristics of the soil ranges from sandy loam to clay with pH from 5.9 to 8.1. Initially, the spines from the collected plants were cut and washed with tap water. Surface sterilization was carried with 70% ethanol for 1 min. The sterilized spines were then washed with double distilled water (ddH2O) to remove traces of ethanol. To isolate endophytic fungi, the spines were cut into 0.5 cm segments and placed carefully in Petri-plates containing Hagem growth media under conditions mentioned above. To confirm the effectiveness of 70% ethanol, the spines were cut into segments and were surface sterilized. The sterilized pieces of spines were then placed on Hagem media  and processed as mentioned earlier. The fungal isolates collected from the Hagem media were grown on PDA media . Endophytic fungi were isolated on Hagem media plates incubated at 28 °C for 7 days. Subculturing of the endophytic fungal isolates was performed by growing the isolates on PDA plates incubated at 28 °C for 7 days. For secondary metabolites production, the isolated endophytes were grown in Czapek broth (Peptone 1%, Glucose, 1, 0.05% MgSO4.7H2SO4, 0.05% KCl and 0.001% FeSO4.7H2SO4 pH 7.3 ± 0.2) maintained at 28 °C and 120 rpm for 7 days . After incubation, fungal cultures were filtered to obtain fungal biomass and respective culture filtrate (CF). Fungal isolate was taken from PDA plates and inoculated in 50 ml Czapek-broth supplemented with 100 mM NaCl to check its ability to resist salt stress. The cultures in the flasks were then incubated for 7 days at 28 °C and at 120 rpm. After 7 days of incubation, the growth of the inoculated fungal isolates was observed. The endophyte FH1 was selected for further study based on its ability to resist 100 mM NaCl. Fungal culture filtrate obtained as described earlier were subjected to gas chromatography-mass spectroscopy (GC/MS-SIM) coupled with selected ion monitoring . The CF of isolate was taken in test tubes and filtered through 0.45 μm cellulose acetate filters. The pH of filtrate was adjusted to 3.0 with 1 N HCl and then extracted with ethyl acetate. The organic layer was evaporated at 45 °C in a water bath. The dried sample was then dissolved in 5 ml of 0.1 M acetic acid and eluted through the reverse phase C18 column using 30, 50, 100% methanol. Methanol from the eluted samples was evaporated at 45 °C using a water bath. The residues left were dissolved in 1 ml of methanol and added 1.5 ml of ethereal diazomethane to prepare methyl ester fraction. The methylated samples were re-dissolved in ethyl acetate before being analyzed by GC/MS-SIM (6890 N network GC system, and 5973 network mass selective detector; Agilent, Palo Alto, CA, USA). For IAA, 1 μL of the sample was injected in a 30 m × 0.25 mm i.d., 0.25 μm film thickness DB-1 capillary column (J & W Scientific Co., Folsom, CA, USA), respectively. The GC oven temperature was programmed as: holding temperature of 70 °C for 2 min, then rise to 200 °C (with a steady increase in temperature, i.e. 20 °C/ minutes) and finally reached to 285 °C (with an increase of 5 °C/ minutes). Helium as a carrier gas was maintained at a head pressure of 30 kPa. The GC was directly interfaced to a mass selective detector with an interface and source temperature of 230 °C, an ionizing voltage of 70 eV, and a dwell time of 100 min. The total phenolics were determined in the CF of isolate FH1 following the method proposed by A Qawasmeh, HK Obied, A Raman and W Wheatley . A blue coloration indicates the presence of phenol and their absorbance was checked at 650 nm using SHIMADZU spectrophotometer (Kyoto, Japan). Gallic acid was used as a standard to quantify the total phenol in CF of FH1. Colorimetric determination of flavonoids was carried out in the CF of isolate FH1, following the protocol of K Srinivasan, L Jagadish, R Shenbhagaraman and J Muthumary . Quercitin was used as a standard for flavonoids determination. A white milky coloration indicates the presence of flavonoids. The CF obtained from our isolate FH1 grown in Czapek medium was assayed for scavenging of the reactive oxygen species (ROS) according to Liu et al., (2007). Approximately, 2 mL of distilled water, 1 mL of 0.1 mM 2, 2 Diphenyl-1-picrylhydrazyl (DPPH) was added to 0.5 mL of CF from isolate FH1. The mixture was shaken vigorously and allowed to stand for 30 min at room temperature. The antioxidant activity of CF was determined by measuring the decrease in absorbance at 517 nm against blank. Methanol was used as a blank and ascorbic acid was used as positive control. A molecular approach was adopted to identify the selected fungal isolate FH1. The genomic DNA of isolate FH1 was extracted following the established protocol  which was previously modified . The fungal isolate FH1 was identified by sequencing the internal transcribed spacer (ITS) region of 18S rDNA using universal primers ITS-1 and ITS-4 . The sequence obtained was subjected to BLASTn1 for sequence homology estimation. The evolutionary history of sequences obtained as a result of homology search was inferred by using the Maximum Likelihood method based on the Tamura-Nei model . The analysis involved 25 nucleotide sequences and the evolutionary analyses were conducted in MEGA7 . The gene sequence of the isolate FH1 was submitted to NCBI GenBank and was allotted with accession no. KY673731. Plant hormones extraction and purification were analyzed by using HPLC according to the method of Kettner and Döerffling . Fresh plant leaves (1 g) were ground at 4 °C in 80% methanol with butylated hydroxy toluene (BHT) as an antioxidant. After 72 h extraction, the pooled extract was centrifuged at 3000 rpm and the supernatant was partitioned at pH 2.5–3 with ethylacetate (1/4th volume of the extract). The ethyl acetate phase was dried down completely on the rotary thin film evaporator (RFE) and the residues were re-dissolved in 100% methanol. The samples were then passed through a Millipore filter (0.45u) and were analyzed by HPLC (Agilent 1100), equipped with variable UV detector and C18 column (39 × 300 mm) (BondaPack Porasil C18, 37/50 μm, Waters, Eschborn, BRD). Methanol and water in the ratio of (30:70; v/v) were used as mobile phase at a flow rate of 1500 μL/min and a run time of 20 min/sample. The plant hormones were identified on the basis of retention time of phytohormone standards. Catalase activity was assayed by previously described method . The activity was estimated by a decrease in the absorbance of H2O2 at 240 nm (1 U of catalase was defined as conversion of 1 μmole of H2O2 per minute). Peroxidase activity (POD) was assayed by following established protocol . Added, 5.55 g of CaCl2 to 100 ml of distilled H2O2 and the resultant solution was cooled on ice prior to use in the assay. After cooling, mixed, 0.5 ml p-Phenylenediamine, 1.5 ml MES, 0.1 ml plant extract, and 0.45 ml H2O2. The MES Buffer alone was used as blank and the optical density was measured at 510 nm, initially soon after mixing the contents and then after 3 min of incubation at room temperature. The proline contents of maize seedling was measured according to the method described by JJ Shaw, DJ Spakowicz, RS Dalal, JH Davis, NA Lehr, BF Dunican, EA Orellana, A Narváez-Trujillo and SA Strobel . The fresh leaf samples (0.2 g) were homogenized in 5 ml (3%) of aqueous sulphosalicylic acid and the homogenate was subjected to centrifugation at 12,000 rpm for 10 min. Equal volume of glacial acetic acid ninhydrin was then added to the supernatant. The mixture was boiled on a water bath adjusted at 100 °C for 1 h and then extraction was done with 4 ml of toluene. The absorbance was measured at 520 nm using toluene as a blank. Data analysis was done using SPSS 20 for Windows. Means comparison was done by analysis of variance (ANOVA) and Duncan multiple range test at P = 0.05. The authors are thankful to the lab members of Abdul WaIi Khan Univrsity Mardan and Kyungpook University Korea for technical support. This research was supported by the Basic Science Research Program through the National Research Foundation of Korea (NRF) funded by the Ministry of Education (2017R1D1A1B04035601). The funding body just provided the funds and doesn’t have any practical role in the design of the study and collection, analysis, and interpretation of data and in writing the manuscript. The datasets generated and analyzed during this study are available from the corresponding author upon reasonable request. The research doesn’t involve and endangered plant species and doesn’t require any approval. Qadir M, Noble AD, Karajeh F, George B. Potential business opportunities from saline water and salt-affected land resources, vol. 5: International Water Management Institute (IWMI). Colombo: CGIAR Research Program on Water, Land and Ecosystems (WLE); 2015. https://doi.org/10.5337/2015.206. Glick BR. Plant growth-promoting bacteria: mechanisms and applications. Scientifica. 2012;2012:1-15. https://doi.org/10.6064/2012/963401. Bohm P. Estimating willingness to pay: why and how? Scand J Econ. 1979:142–53 DOI: 1https://doi.org/10.1111/sjoe.12168.